1. Pre-heat the oven to 190 C. In the meanwhile, pour tomato puree in the bottom of the baking dish. I used a small round dish, you can use a 10″ long oval dish as suggested in the recipe. Add chopped onions, stir in 1 tablespoon of olive oil. Season well with salt & black pepper. 2. Trim the ends of eggplant. Carefully remove the core from yellow & red pepper, leaving the shell intact. Slice them as thin as possible or use a mandoline as suggested in the recipe. 3. 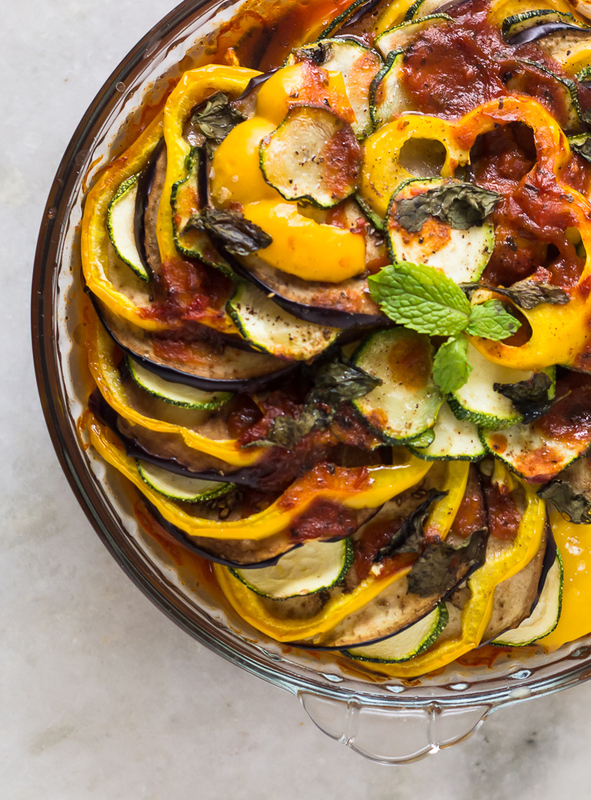 Arrange the vegetables atop the prepared sauce in a concentric manner and overlapping each other. Try to place them as close to each other as possible with only little edge showing of each vegetable. 4. Drizzle the remaining olive oil over the arranged vegetables. Season with salt & pepper & some herbs (fresh or dried). 5. Cover the dish with a parchment paper fitting just inside the dish & not coming outside. Bake for about 30 minutes till the veggies are tender but not burnt & the sauce has started bubbling around them. Serve hot with cheese or plain. A compact arrangement of veggies is important as after baking they will shrink. So do not worry about a over filling the dish with veggies. You can add or remove any other vegetable of your choice, in the first version I had made with cucumber instead of zucchini. Don’t be afraid and experiment.